The current affairs multiple choice questions have been created from the events recently happened in India. Such current affairs quizzes are quite important for IAS Prelims Exam. 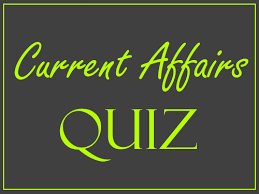 Read and practice the current affairs quizzes provided in this article. From now, there is less than three months remains for the IAS Prelims Exam, so, by wasting no time the IAS aspirants should be more dedicated for the upcoming IAS Prelims Exam 2017. Here, we have provided a current affairs quizzes for the preparation IAS Prelims Exam. I. Hamari Dharohar has an objective to curate rich heritage of minorities under overall concept of Indian Culture. II. The scheme will provide support to ethnic museums (not supported under schemes of Ministry of Culture or its bodies) for showcasing and preserving heritage of minority communities. Ministry of Minority Affairs has been mandated to look after all issues related with minorities except Law and Order as per Allocation of Business. Therefore going with the priority of the Government, Ministry of Minority Affairs intends to launch a new scheme “Hamari Dharohar” to preserve rich culture and heritage of minority communities of India. • Preservation of literature/ documents etc. • Support and promotion of calligraphy etc. • Curating exhibitions including iconic exhibitions. • Preservation of literature, documents, manuscripts etc. • Documentation of oral traditions and art forms. • Support to ethnic museums (not supported under schemes of Ministry of Culture or its bodies) for showcasing and preserving heritage of minority communities. • Support for organizing heritage related seminars/ workshops. • Fellowship for research in preservation of heritage and development. • Any other support to individual/ organization in furtherance of cause of protection and promotion of rich heritage of minority communities. 2. The Union Ministry of Urban Development under the Central scheme HRIDAY has approved the development of 6-kilometer-long Bet Dwarka Darshan Circuit in which of the following states in India? The Union Ministry of Urban Development under the Central scheme HRIDAY has approved the development of 6-kilometer-long Bet Dwarka Darshan Circuit in Gujarat. The circuit will be developed at an expense of Rs 16.27 crore under the Central Scheme ‘Heritage City Development and Augmentation Yojana (HRIDAY)’. The Bet Dwarka Darshan Circuit that connects the famous Dwarkadish Haveli and Hanuman Dandi was approved by the HRIDAY National Empowered Committee chaired by Rajiv Gauba, Secretary (UD). Hanuman Dandi is the only temple housing Hanumanji and his son Makardhwaj, in Dwarka district of Gujarat. HRIDAY, the ‘National Heritage Development and Augmentation Yojana’ was launched on 21 January 2015, seek to preserve and rejuvenate the rich cultural heritage of the country. 3. Which of the following states has become the 22nd state to join the UDAY scheme of the Ministry of power? The Government of India and the State of Sikkim signed a Memorandum of Understanding (MOU) under the Scheme Ujwal DISCOM Assurance Yojana (UDAY) today, for operational improvement of the State’s Power Distribution Department. With the signing of MoU, the total number of States covered under UDAY has reached twenty-two. Sikkim would derive an Overall Net Benefit of approximately Rs. 207 crores through UDAY by way of cheaper funds, reduction in AT&C and transmission losses, interventions in energy efficiency, etc. during the period of turnaround. Demand Side interventions in UDAY such as usage of energy-efficient LED bulbs, agricultural pumps, fans & air-conditioners and efficient industrial equipment through PAT (Perform, Achieve, and Trade) would help in reducing peak load, flatten load curve and thus help in reducing energy consumption in the State of Sikkim. The gain is expected to be around Rs.25 crores. 4. With which of the following countries India has ratified the Social Security Agreement (SSA) recently? Recently, India and Germany have ratified the Social Security Agreement (SSA), which will commence from May 1 this year, to help promote more investment flows between the two countries. The ratified SSA will also integrate the provisions of the 2008 social insurance pact that exempts detached workers of the two countries from making social security contributions in either country so long as they were making such contributions in their respective countries and the 2008 pact will then cease to be in force. As per the External Affairs Ministry of India, "the new agreement establishes the rights and obligations of nationals of both countries and provides for equal treatment of the nationals of both countries ...the requirements to be entitled to a pension can be met by aggregating the periods of insurance completed in India and Germany, whereby each country pays only the pension for the insurance periods covered by its laws. The period of posting will be up to 48 calendar months”. I. It is a new initiatives seeks to promote ‘Transit Oriented Development (TOD)’ which enables people to live within walking or cycling distance from transit corridors like the Metros, Monorail and Bus Rapid Transit (BRT) corridors, currently being taken up on a large scale. II. Under the new Metro Policy, TOD has been mandatory while under Green Urban Mobility Scheme, TOD has been made an essential reform and is given priority for receiving central assistance. III. TOD is being taken up Ahmedabad, Delhi (Karkardooma), Naya Raipur, Nagpur and Navi Mumbai and the Ministry would like this to be expanded to other cities as well. To effectively address the emerging urbanization challenges, the Ministry of Urban Development has come out with a multi-pronged policy framework to promote living close to mass urban transit corridors. This new initiatives seeks to promote ‘Transit Oriented Development (TOD)’ which enables people to live within walking or cycling distance from transit corridors like the Metros, Monorail and Bus Rapid Transit (BRT) corridors, currently being taken up on a large scale. The Ministry has formulated a ‘National Transit Oriented Development Policy’ which will be discussed with the States and Union Territories at a National Workshop on Urban Development to be held Tuesday next week. This policy seeks to enhance the depth of understanding of States and UTs on TOD as a viable solution to many of the challenges like haphazard urban growth and sprawl, mobility, rapidly rising private vehicles on roads, pollution, housing choices etc.. This new urban design and planning in the form of TOD, is being incentivised by the Ministry under two more initiatives viz., Metro Policy and Green Urban Mobility Scheme which also will be discussed with States and UTS for taking them on board.